It's Free, Sign Me Up! Looking to buy a new home, condo or any other property? Search thousands of properties in our real estate listings. Let us create a customized marketing plan to sell your property. Are you looking for Spanish Fort Real Estate Deals? Realtor, Michelle Beckham & the Beckham Partners Team are here to help - we can provide you a custom home search. SOLD!Spanish Fort 3 Bedrooms 2 Bathrooms avail. only $129,900! SOLD! Spanish Fort 2BR Condo in Churchill Downs, listed for $109,900! 2 story floor plan has 4br/3ba plus bonus room, study and keeping room! Screened in porch plus covered patio, great for entertaining. SOLD! Spanish Fort 4BR + Bonus Room, 2.5BA w/SCREEN-IN POOL! Westminster Gates, MUST SEE! SOLD!!! 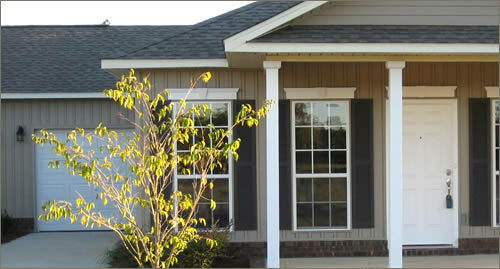 Audubon Spanish Fort - Brand-New Home Just Listed: 4BR + Bonus Room, Study & Keeping Room, 3.5BA MUST SEE!!! SOLD!!! Spanish Fort 4BR 3BA w/POOL! Must See!!! SOLD!!! 5BR 3BA in Audubon (Brand-New Home & Neighborhood is clostest to Spanish Fort Schools!) 3522 Square Feet on over an acre of land - MUST SEE!!! 3BR 2BA Condo - NOW $109,900! 2BR 2BA Condo - NOW $129,900! Have You Seen Churchill Downs - Brand-New Spanish Fort Condos??? Spanish Fort Condos - Charleston Style with Garage & Yard (Lawncare Provided!) Stainless Appliances, Smooth Ceilings, Neighborhood Park, 100% Financing & Closing Costs Paid - MOVE IN FOR NOTHING DOWN! Spanish Fort rests on a hill overlooking Mobile Bay, and incorporates a dining & entertainment district known as 'The Causeway'. What many consider to be the best seafood restaurants on the entire Alabama Gulf Coast, are located on the Causeway! These include waterfront dining restaurants, Ed's Seafood Shed, The Original Oyster House, Tacky Jack's and Felix's Fish Camp, as well as the top tourist draw in the state of Alabama: The USS Alabama Battleship memorial park. In addition, Spanish Fort is surrounded by the natural beauty of Mobile Bay's Delta, including hundreds of islands, and the Southeast's premiere destination for fishermen, hunters and nature enthusiasts. Also on the Causeway, Spanish Fort boasts Meaher State Park (1,327-acres - boat ramp, fishing pier & boardwalk out into Mobile Bay). Also, on the banks of Mobile Bay's Delta, is Historic Blakely State Park (3,800 acres), as well as the new 83-acre complex called Five Rivers - Alabama's Delta Resource Center. On November 17, 2004, the Eastern Shore Centre had its grand opening in an area of Spanish Fort commonly been called Malbis, at Highway 181 and I-10. The Centre is a "lifestyle" design, with outdoor access between stores. This shopping mall has seen major development, and another development, Spanish Fort Town Center, including a Bass Pro Shops, a JCPenney, and a Courtyard by Marriott, is also slated to open in 2007 encompassing 257 acres on the northeast corner of I-10 and Highway 90 in Spanish Fort, Alabama. Property Search (MLS) Online - find your home online today! Are you looking for Real Estate recommendations in Spanish Fort Alabama? Let us help. If you are looking to buy or sell a home in Alabama, you can browse ERAClass.com's listings right here, online! This Website offers homes for sale, for lease, Waterfront and Bayfront Real Estate, from experienced Realtors, Agents, Brokers, and other professionals in the relocation business.